Joaquim Maria Machado de Assis, prominent Brazilian writer and first President of the Brazilian Academy of Literature, was born in 1839 in the city of Rio de Janeiro to Francisco de Assis, a mulato father, and Maria Leopoldina Machado de Assis, a white Portuguese mother. Machado was married in 1869 to Carolina de Novais, his companion for 35 years. 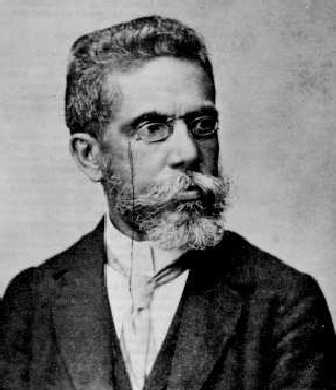 Of humble origins, Machado de Assis received little formal education and worked in a variety of occupations (typographer, copy write editor, journalist, and commentator), while writing poetry and essays for different publications (A Marmota, O Paraíba, O Espelho, Diário do Rio de Janeiro). From 1873 to 1908, year of his death, Machado occupied a bureaucratic position at the Agricultural Department, rising to the top of the organization. This arrangement allowed the writer financial stability and the freedom necessary to pursue his literary career. Machado’s work was well received and, in 1868, he was commended as Cavaleiro da Ordem da Rosa (a formal recognition of achievement by the Imperial order). Well connected in the literary circles of the time, Machado was respected and admired by his peers. He wrote poetry, plays, essays, short stories, and romances. Among the latter, it is worth noting the publication, in 1881, of The Posthumous Memories of Bras Cubas, considered by many his masterpiece, followed by Quincas Borba in 1891 and Don Casmurro, in 1900, to name some of his most acclaimed works. The very title of Posthumous Memories of Bras Cubas displayed Machado’s irony, since the main character and “author” of the novel was dead! Machado de Assis deeply understood Brazilian society in all of its contradictions. His work revealed a fine irony and sense of humor – his tools for unmasking the paradoxes of Brazilian social mores. Machado’s race and class origins allowed him to see Brazil from a very unique stance. Literary critic Roberto Schwarz compares Machado’s narrative style to Chateubriand, Henry James, Marcel Proust, and Thomas Mann, noting his prose pierced local Rio de Janeiro society, yet transcended time and space. Eduardo de Assis Duarte, “Machado de Assis’ African Descent,” Research in African Literatures 38.1 (2007), 134-151; Roberto Schwarz, A Master on the Periphery of Capitalism (Durham, North Carolina: Duke University Press, 2001); Kwame Anthony Appiah and Henry Louis Gates, Jr., eds., Africana: The Encyclopedia of the African and African American Experience (New York: Oxford University Press, 2005), 1215.